Standing on the edge of a large swimming pool, Detour wags his tail, expectantly. The 18-month-old Labrador retriever keeps his eyes on the bright orange chew toy in his owner Angie Middaugh's hand. Then, with an ungraceful leap, Detour splashes into the pool to retrieve his prize. The yellow Lab doesn't know it yet, but he's just had his first taste of a new competitive sport taking hold near the Hillsboro Airport. 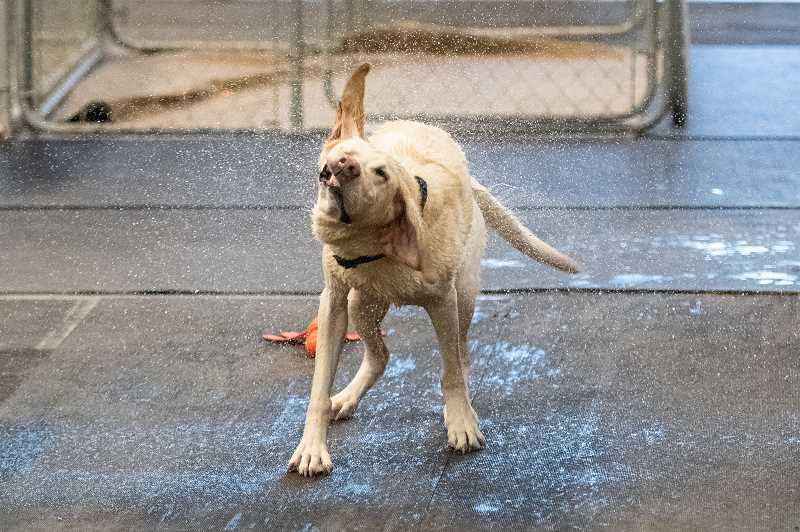 Since 2015, Paws Aquatic Water Sports and Rehab has been helping dogs with physical ailments get back on their feet through water rehabilitation, but the center, 1800 N.E. 25th Ave., near the Hillsboro Airport, has been ddrawing attention in recent years, not for its therapeutic work, but for a dog-friendly sport called "dock diving." Dock diving is the fastest growing canine sport in the world, PAWS co-owner Julie Thomas said. The rules are pretty straightforward. One at a time, the dogs take their positions, then sprint toward a 40-foot-long swimming pool after a chew toy. Leaping into their air, the dogs land with a splash to retrieve the object. Competitions are judged by height or distance. Canine sports have grown in popularity over the years. Sporting events like greyhound or sled dog racing have been attracting spectators for decades. Obedience trials and agility competitions are staples at the American Kennel Club dog show in Portland each year. 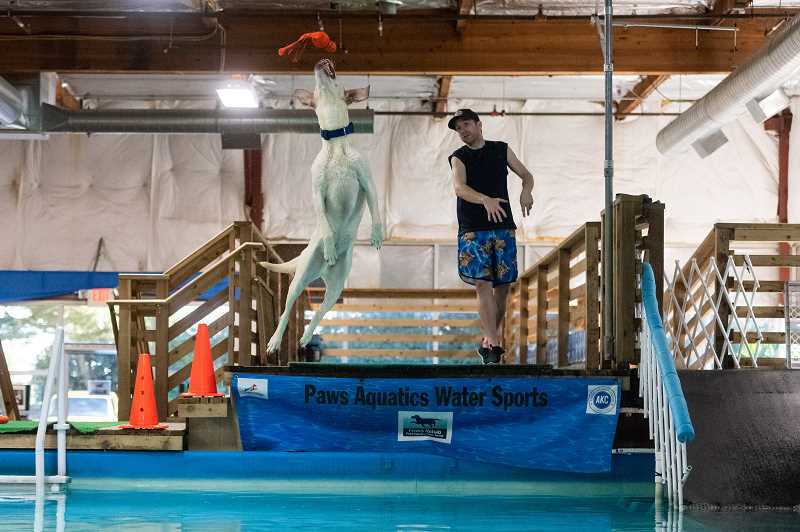 PAWS will host a two-day dock diving competition on Saturday, Feb. 16 and Sunday, Feb. 17, drawing between 40 to 60 experienced doggy athletes. More dogs are expected at the center's annual competition during the Oregon International Air Show in late September. The event is free to watch and open to the public. While the sport is growing in popularity, Thomas said most dogs that compete have few places to practice. Trainers are forced to use outdoor facilities, such as local lakes, which can be unappealing during Oregon's cold, wet winters. PAWS Rehab is one of only four indoor dock diving facilities in the United States, Thomas said. The center regularly has people drive from Seattle, California or Alberta, Canada to use the facility to practice. "People are pretty serious about this," said Thomas, who spent years working at Intel before opening PAWS. In addition to its competitions, the swim center hosts open dock diving practice sessions on Saturday afternoons, and open recreational swimming for dogs on Sundays. The center offers private lessons and workshops in dock diving as well. "You can tell the dogs are having a good time," Thomas said. "They're all smiles." Middaugh, Detour's owner, heard about the unique sport while volunteering with a local dog rescue. "It just absolutely spoke to me," Middaugh said. "I knew that if I ever had a dog that was right for this, I'd completely do it." In most dock diving events, Thomas said, dogs largely compete against themselves, as trainers try to coax the most out of their dogs. That has led to an inclusive community that support one another, Middaugh said. Trainers often offer advice and help one another with tips and tricks. "It's a great environment with a lot of supportive people," Middaugh said. Like many dog owners, Middaugh and Detour went through obedience training, but as the dog has gotten older he has started to lose some of the practices he had mastered as a puppy, Middaugh said. Activities like dock diving give the pair a chance to keep those skills highly tuned, as well as provide Detour with plenty of exercise — both mentally and physically. "We come home completely exhausted," Middaugh said. "When dogs compete, they have to keep their focus on you. They don't run until they are given the command. That translates into the real world, too. I can be out in a public place and the dogs are focused on me." Middaugh said she was looking for a way for her dog to get a good workout, both physically as well as mentally. "You can see them thinking through everything," Middaugh said. "He had to think everything through. How to get into the water; how to get back out; where the toy was. He's a tired puppy. And a tired puppy is a good puppy." Editor's Note: A previous verson of this story incorrectly listed the dates of the competition, which is scheduled for Feb. 16 and 17.